Outside of city planning area (rural area industrial introduction district). Loam layer, Gravelly layer, Sand gravelly layer. 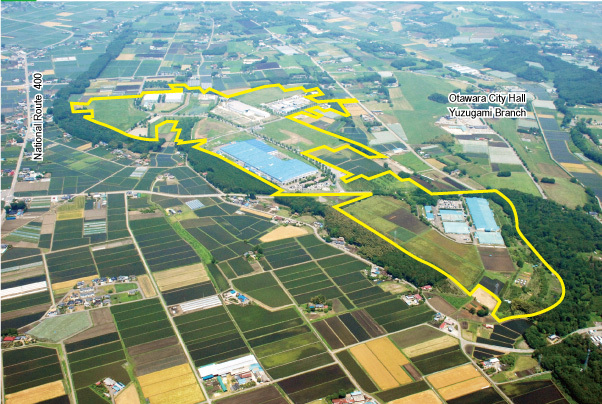 To enter into a Pollution Control Agreement based on Tochigi Living Environment Preservation Act and Act of the city. To drain by exclusive drainage pipe after the processing (max BOD 10 mg./liter or less) by each company individually. High voltage（6kV）: Supply facilities are available in the park. Special high voltage (66kV): Available in Hiruta Otawara-shi. 12 km, 20 minutes by car, from JR Nishinasuno station on JR Utsunomiya Line. 15 km, 25 minutes by car, from JR Nasushiobara station on Tohoku Shinkansen. 0.9 km, 1 minute, from National Route 400. 2.0 km, 4 minutes, from National Route 294. 12 km, 20 minutes, from National Route 4. 17 km, 25 minutes, from the Nishinasuno Shiobara interchange on the Tohoku Expressway. 20 km, 30 minutes, from the Yaita interchange on the Tohoku Expressway. Enterprises relevant to the manufacturing, etc. of pharmaceuticals, medical equipment, quasi-drugs, cosmetics, foods for special use. To acquire or rent 5,000 m2 or more land newly at Industrial Parks or Agricultural Industrial Parks, or factory suitable sites in the city, and to establish or rent 1,000m2 or more business operations newly. 10 or more full-time employees. To start its operation within 5 years from the date of the land acquisition ( or lease ). ・An equivalent amount of the fixed assets tax. Companies relevant to the manufacturing, etc. of welfare equipment. To newly acquire or rent 1,000 m2 or more land at Industrial Parks or Agricultural Industrial Parks, or factory suitable sites in the city, and to newly establish or rent 500m2 or more business operations. 5 or more full-time employees. To newly acquire or rent 5,000 m2 or more land at Industrial Parks or Agricultural Industrial Parks, or factory suitable sites in the city, and to newly establish or rent 1,000m2 or more business operation. However, 100 % for an operator who has the headquarter functions or research and development functions.